Everyone has experienced a Saturday morning filled with hunger and laziness. We try to find a way to avoid cooking and cleaning for ourselves, So what do we do next? In most cases we decide to order food for pick up, freeing ourselves from any cooking and cleaning. We roll over on one side of our bed and pick up our phone to endlessly search for food to curb our ap petite. With extensive choices, we may become paralyzed for a few minutes until we make a tough decision of where to eat. This all too familiar process makes it difficult for both restaurants and customers to align their interests. And at this point, we can only hope for a better solution in regards to finding our favorite restaurant all the while enabling the business to increase their bottom line while being cost effective. We no longer need to hope for a better solution because the solution is to go mobile with bIztroapps. Today we live in a mobile world where 6.1 billion people own and operate on a smartphone daily. In regards to tapping into such a large market, we find it to be very difficult especially when customers access is limited to search engines like Google and Yelp. This is where a mobile app can come into play, by constantly reminding customers of your brand every time they open their phone. This inevitably creates brand recognition and whenever a customer has that early morning hunger they will be thinking of you. 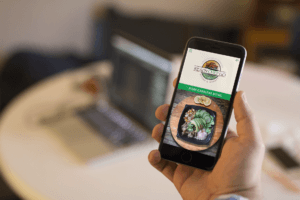 Mobile apps for restaurants have the ability to instantly connect with customers and keep them coming back by utilizing a multitude of in-house features. This idea of retention goes beyond just loyalty programs and instead creates a community through instant communication. Now we have push notifications and enabled GPS-based coupons to incentivize purchases ultimately creating the perfect simple solution for an efficient and cost-effective business based on the customer’s convenience. Throw away the punch cards because now Biztroapps can automatically track purchases through customers phones. Use a secret code to record customer purchases in order to reward their loyalty for a free meal, cup of coffee or whatever you feel is most fitting! GPS coupons can boost business by using new technology called “geofencing.” This technology allows us to send updates on coupons to customers in specific area’s to entice them to eat at your restaurant. Customers can receive rewards just by walking into your door, bringing in more foot traffic and ultimately raising your bottom line. Customers can be ready to order by clicking through their purchase history and knowing exactly what food they enjoyed the last time they ate at your restaurant. This provides another way to free up employees from trying to play the food guessing game with customers. “In-app ordering” creates a lead time that will enable your kitchen to make more food and act as efficient as possible. Not only does the order print directly to your kitchen but it allows customers to pay online linking straight to your PayPal account. With our mobile reservations, customers can find a seat for themselves without going through the back forth conversations of whether there is an opening or not. This keep’s your employee focused on face to face customer service and organizes your FOH without doing any extra work. Customers can promote your business with a simple click. No need for marketing representatives or expensive promotions. Customers can share your business through all of your social media platforms with the click of a button. New businesses can organically grow, simply from your customer’s referrals. It is clear to see that in 2016, having an app has become a necessity to stay relevant. Whether it be today or a year from now, in time everyone will have an app to meet the market’s needs. So it’s ultimately up to you. Why wait to be behind the curve? Make the decision to advance your restaurant by utilizing Biztroapps to go mobile.